East Bay Traditional Jazz Society | Our Kind Of Music! 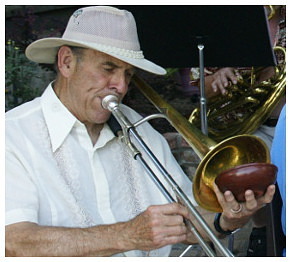 Welcome to Trad Jazz in the East Bay! The East Bay Traditional Jazz Society is a non-profit organization dedicated to the education, promotion, preservation, and enjoyment of live, traditional jazz. We wish to promote and expand interest in this art form among people of all ages. For an great overview of our Society, see our Introduction. We shall endeavor to develop a sense of community through an increased awareness of the historical significance of traditional jazz music. It is our firm desire to see the East Bay Traditional Jazz Society continually strive to provide funds / donations / contributions for youth scholarship programs, and continue to serve communities in the East Bay in perpetuity. AN OVERVIEW OF OUR CURRENT ACTIVITIES.